Its name says it all… Bath.This stunning town is set in the rolling countryside of south-west England at the southern end of the Cotswolds.It’s one place that has been on our ‘must see’ for a very long time. Gai and I were lucky enough to visit while house and pet sitting in the Cotswolds. We stayed in a cute boutique hotel on the edge of town out of the main traffic. It was still close enough to walk into town, which we did several times. Bath is famous for a number of things, but perhaps most notably its natural hot springs and 18th century Georgian architecture with heavy use of the honey-coloured Bath stone. 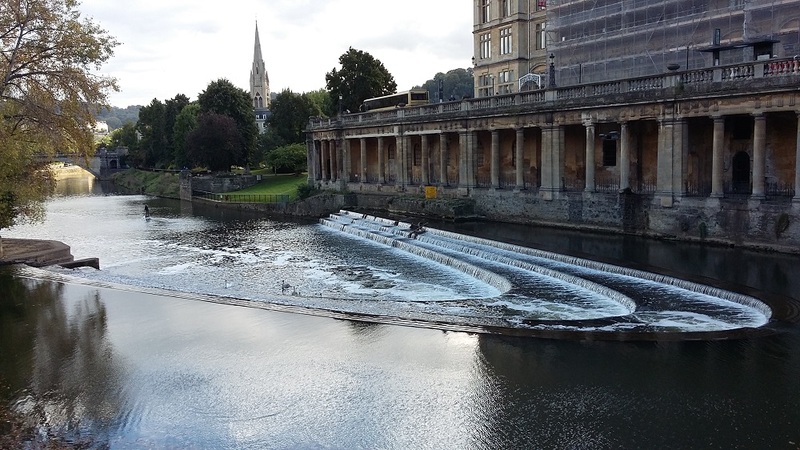 It all began in the first century – when the Romans came to bathe in Bath. We consider our daily bath time to be private, however ancient Roman civilizations saw this time as a shared community activity. Most people took the ‘all in together’ option. Only the extremely wealthy Romans had a private bath. Community bath houses were normally built near a river and used a log fire to heat the water. Yet the site at Bath was built near thermal springs. That meant hot water 24/7. The site is the only natural hot water springs in the United Kingdom. Not surprisingly this healing spa became famous in the ancient world as a spa town. The city of Bath grew around the springs, in the valley of the River Avon. These days, the spring produces a million litres of comfortably hot, mineral rich water. 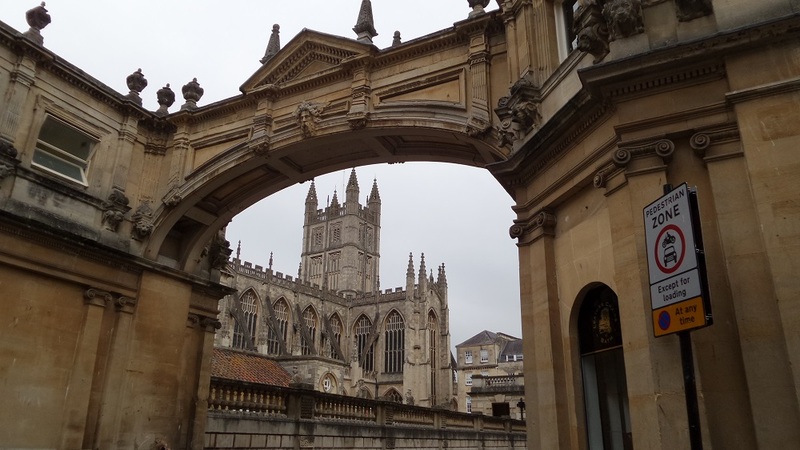 Bath is one of the prettiest towns we’ve seen in all of our travels. The honeycomb stone and the beautifully proportioned Georgian architecture have produced a very elegant, functional city. We loved the detail and craftsmanship that makes the buildings so luxurious. The Romans left behind a legacy of beautiful public spaces and streets. Thankfully, the entire city of Bath has World Heritage protection, partly due to the effort of 18th century architect John Wood. Bath was his home town and he brought back the ancient elegance. One of the local, wealthy families made generous contributions to the creation of the Bath we see today. They commissioned a stunning bridge across the River Avon. The strip of stone facades along Pulteney Street is very soothing. The sameness only applies to the exterior. Once you’re inside, you can build any style you like. Today, this long row of elegant housing is considered a premium position. A check of rentals online reveals the monthly fees to be quite reasonable by Australian standards. We love this place so much we have considered packing up at some stage and moving to Bath for three months. Again, the Cotswolds has proven a great place to base ourselves as we explore the entire region. 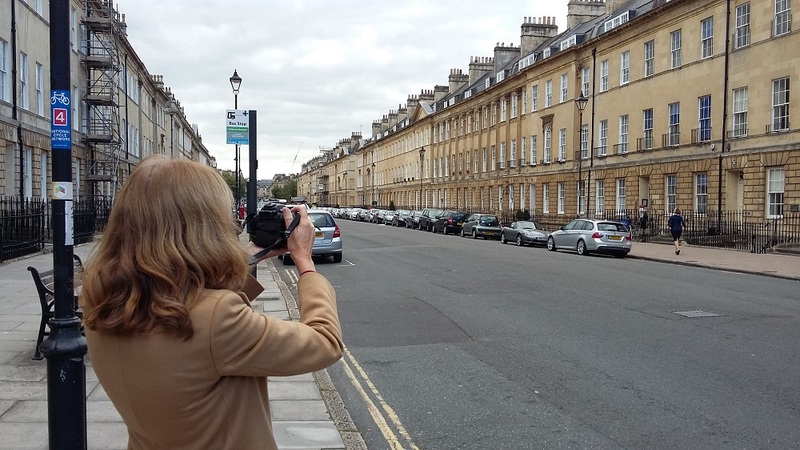 There is a lot to see in Bath itself. It has a fascinating history datings back, of course, to Roman times. During its halcyon days, Bath was the centre of fashionable English life. Many travelled from London to been seen in Bath. The spa waters attracted high society. After they wallowed in the waters of the bath house, the fashionistas of the day put on their finest outfits and enjoyed live music in what is known as the Pump Room, a huge ballroom-like space with a chamber ensemble playing at one end and waiters in their crisp white aprons serving the customers! Music has been played in the Pump Room ever since the late 1700s when the elegant space was opened. The deluxe room still operates in much the same way it did back then. A dazzling array of goodies are on display in mirrored counters. We ended our tour of Bath with warm scones, sweet strawberry jam and of course… clotted cream! Our visit to this magnificent city has been exhilarating. It’s easy to get around, walking being the best option. No doubt about those Romans. Everywhere you look in Bath you will see heavy Roman influence. It is difficult not to be impressed and what they left in Bath has anchored the layers of what came after their extraordinary vision.